The Rugeley Flood Alleviation Scheme was highly commended at the 2018 CIEEM Awards. 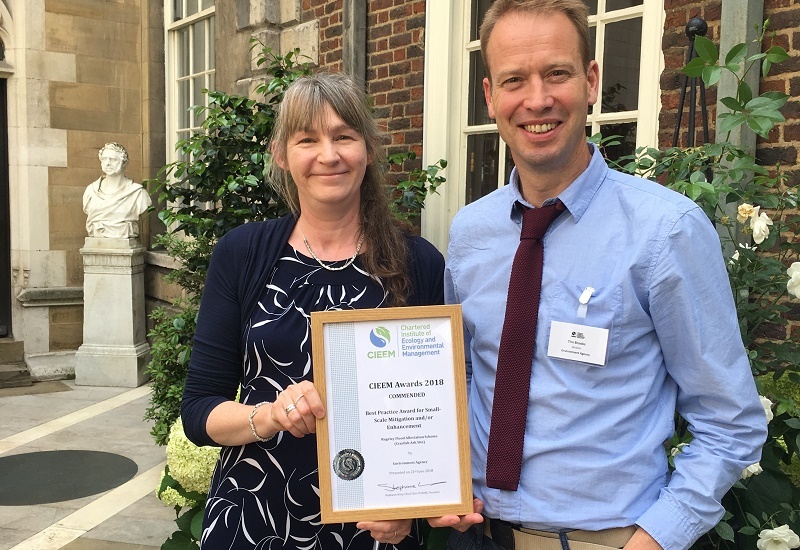 The Chartered Institute of Ecology and Environmental Management (CIEEM) Awards – which were presented in London on 21 June – recognise projects that have had a major impact in terms of benefiting nature. The Rugeley scheme, carried out by Team Van Oord on behalf of the Environment Agency, was highly commended in the Best Practice Award for Small Scale Mitigation and/or Enhancement category – a new award for 2018. Under the terms of the contract awarded by the Environment Agency, TVO was required to mitigate against harm to the White Clawed Crayfish* inhabiting Rising Brook in Rugeley, where the works took place. Works were undertaken not only to mitigate the impact on this species, but to strengthen their survival chances by establishing a new population in a safe location. In March 2017, Team Van Oord successfully and safely removed more than 300 of the endangered crayfish from the area. Completed at the end of 2017, the flood alleviation scheme has helped reduce flood risk to more than 114 residential and 157 commercial properties in Rugeley. The scheme also forms an integral part of the local council’s plans to regenerate the town centre. The Rugeley Flood Alleviation Scheme was officially opened in December 2017. 2018 is the third time in the past four years that a scheme carried out by Team Van Oord, or one of its partners, has been shortlisted for a CIEEM award. In 2017, Team Van Oord partner Kier triumphed in the ‘stakeholder engagement’ category, in recognition of its work on the Mersey Gateway toll bridge. The same project was also highly commended in the ‘knowledge sharing’ category at the 2017 ceremony. In 2015, the Steart Coastal Management Project – the UK’s largest coastal management scheme, carried out by Team Van Oord on behalf of the Environment Agency – was named a finalist, also in the ‘stakeholder engagement’ category. *The White Clawed Crayfish (austropotamobius pallipes) is an endangered European freshwater crayfish, and the only species of crayfish native to the British Isles. Looking much like miniature lobsters, the crayfish hide away under rocks and logs during the day, emerging at night to prey on larvae, snails and plants. Despite their endangered status in the UK, large populations can still be found in clean, well-oxygenated rivers and lakes across other parts of Europe.